What went wrong? I think it was a combination of errors. First, I used a hook that was too large for the gauge of yarn. Cascade is a light worsted, almost dk weight. I used a J hook, and later a G when I realized my error, but it made the squares too drapey, which when wet had no body to hold itself together. Then I blame my lack of experience in burying ends in crochet. I thought if I just crocheted over the tails it would be enough, but I think now that I needed to bury them more deligently. Then, I blame the yarn choice. While Cascade 220 superwash is a dream to work with, In my opinion it might be best served on smaller items, like sweaters and such. Certainly not 60 12" square grannies. But anyway, it's all good now and it is really all about the learning. OOOOH!!! Your Cath Kidston lookalike is beautiful!!! Sorry to hear you had a problem with the yarn fading and all... But in the end it came out gorgeous! !Thanks for posting on my blog and letting me know I was an inspiration to you, It makes me happy to hear that. I haven't posted on my blog in 6 months or so, I really should start posting again, your post made me remember how much fun it is sharing on each others blogs. 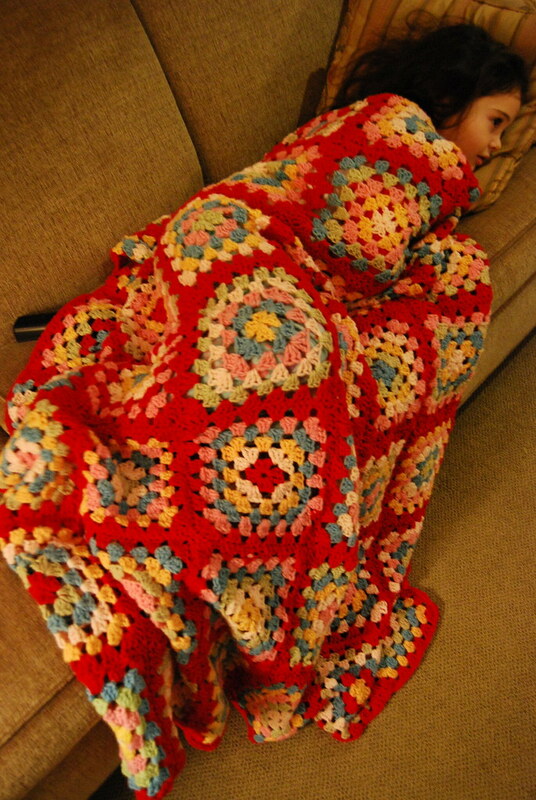 That really makes me want to make a Granny Blanky. It's beautiful! !